There is much discussion regarding waste and inefficiency in the construction of a building, yet most A/E/C firms struggle to find the same level of efficiency improvements realized in the manufacturing sector over the past two decades. I believe a major challenge holding the industry back is the ever-changing roster of contributors to a construction project. You have many contractors through the lifecycle of the project. Names change, companies change, and we each operate through our preferred channels of communication. This inconsistency complicates the ability to achieve cohesion as a team. Imagine if we could each agree on #Slack —all of our problems would be solved! Across all these players, there are also differing levels of communication skills, technological skills, and attention to detail. Gaining alignment on one platform is a challenging proposition within a single company, much less dozens of companies loosely coupled by AIA contracts. Who owns the communication across a construction project? It is not the owner/client of the project. They are working on leveraging the new facility to increase and improve productivity of their company or institution. It is not the designer(s) of the project, either. They inform the plan for building or renovating the property. Client owners often retain a Construction Manager (CM) to manage all the facets of a construction project, including the communication between skilled professionals to coordinate the orchestrated effort of executing a design. (Note that I’m referring to Construction Manager as a project role, not a specific project delivery approach.) The range of contributors include architects, engineers, project managers, skilled labor, contractors, construction managers, accounting staff members, owner staff members, regulatory officials, haulers, security guards, and on and on. There is a critical need to centralize all communication and access to information to enable all contributors to be able to make informed decisions with regard to their responsibilities for completing a construction project. It is within these thousands of collaborations and communications where waste and inefficiency can be found and eradicated. Successful Construction Management teams have established processes and platforms to improve the collaboration of all contributing members. The CM who owns the platform must recognize the need for user participation, provide ample support to compel internal and external users to participate, and facilitate the hell out of it. Perhaps the ‘C’ in CM should be communication. I recently partnered with a client to implement the BIM 360 Docs platform from Autodesk. This firm specializes in Design-Build projects and is tightly partnered with a specific Architectural and MEP Engineering firm. Their decision to invest in the Autodesk platform stems from the extensive use of Autodesk products by the two partner design firms. This post is in no way a strict endorsement of Autodesk, as there are many software providers offering a solution to centralize project information and communications. Others have found success using integrated, best-of-breed solutions across multiple products. The process of software selection requires an analysis of what the problems the CM is trying to solve, technical capabilities of staff and, of course, budget. Please reach out if you would like to discuss these considerations specific to your applications. My goal with this post is to provide high-level considerations for implementing BIM 360 for construction management projects. Below I share my experience implementing Autodesk BIM 360 for the first 90 days of software use. Our first step was to identify the scope of contributors to be introduced to the platform. Unless you are a startup, your company has existing platforms and processes that need to be adapted to or replaced by the Autodesk BIM 360 platform – or any other platform you choose. You should also start by determining who the company intends to engage directly on the platform. Most firms have already adopted an online shared storage solution for exchanging project documents that are either too big or too important to be shared through email attachments. Additionally, the status of an email request is impossible to gauge without a phone call or another email. Requirements typically include the ability to synchronize, secure, and share access to project information. Examples of these include cloud storage services such as Dropbox, Box.com, Microsoft OneDrive or ShareFile, to name just a few. When considering Autodesk BIM 360, the CM must determine the level of interaction expected from external contributors. This is important to understand the license volume you will need to maintain to support a project throughout its lifecycle. Determine which specific processes you plan to implement on the newly-acquired platform, based upon priority order. Email has been a core tool for communicating with project partners since the end of the last century. What role will email play in your project? Can you rely on it? At the start of the implementation phase, identify the biggest challenges you are attempting to resolve with the platform decision. Which components do you need to get the most from the solution? Autodesk is in a state of transition between their legacy applications and a shiny, new integrated cloud platform designed to bridge design activities with construction and facilities management. The new platform also promises an open architecture to allow for integration with other software solutions through the use of Application Programming Interfaces (API). 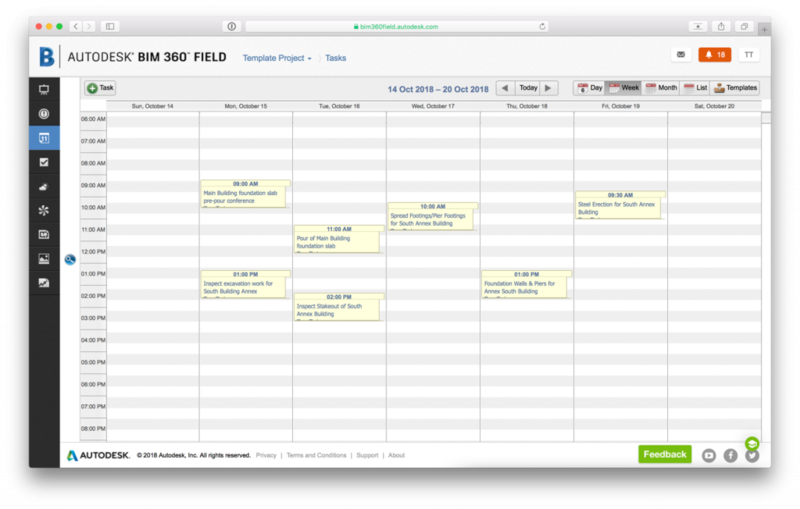 Navigating the legacy and new platform does create a somewhat disconnected experience between BIM 360 Docs (new) and BIM Field (legacy), but Autodesk has made it manageable. You must thoroughly assess the features of the new and legacy services you are considering within the Autodesk BIM ecosystem to better inform your initial implementation choices. How Many Seats are Required to Use the BIM 360 Solution? Adopting the platform as marketed would require a basic BIM 360 Docs seat for anyone who engages the project. A phased approach to implementation could allow an initial savings on base BIM 360 Docs seats until you are ready to incorporate all processes into the platform. This will be dictated by the priority of those issues you are attempting to address with the solution. Employing specific software services, like BIM 360 Design or BIM 360 Build, in support of design or construction, requires a specific service seat enabled by a BIM 360 Docs seat. A base BIM 360 Docs seat accompanies the purchase of an advanced service seat. For example, the purchase of a BIM 360 Build seat will include a BIM 360 Docs seat. Of note, a BIM 360 Build purchase currently includes a seat of the legacy BIM Field for use under the same license. If you intend to use BIM Field, be sure to let your reseller know prior to purchase. So, you have invested in Autodesk BIM 360, taken the time to familiarize yourself with the platform, and learned about the interaction between services. This may seem like an obvious approach, but is rarely the way most people embark with a new software program. We have all engaged enough software interfaces in our lives to think we can “just figure it out.” This is a big mistake: RTFM! Read the Manual. I strongly recommend that you purchase training hours from your Autodesk reseller or a qualified training consultant. You will need to maintain dedicated staff to set up and support the platform. If your budget does not allow for the extra cost of training, Autodesk has developed an extensive knowledge base, including helpful training videos. Allocate time to review the basics of the platform in your implementation project plan. This requires an Autodesk login to be set up based on an email address. The Autodesk user is free to create, but allowing a user to connect to the BIM 360 Docs project will require a seat license per Autodesk BIM 360 Docs pricing. The owner of the BIM 360 project will typically pay for the license to be used for the project; in the case of our project it was the Construction Management company. A best practice is to identify and configure the known contracting companies you regularly partner with, so they can be easily added to a project. This is a good, quick step to start realizing the value of a centralized platform – when you simply assign a contractor to a task from a dropdown list, and all their contact information is readily available. Feel the power. This step is required if you bought extra BIM 360 Docs seats to allow external partners to engage the platform for activities like document libraries or submitting RFIs to the RFI flow. We did not set up this level of granularity for our launch, as contact with specific individuals in subcontracting organizations was still done from the project manager’s Rolodex. The first project you create should be a template project. This template can then be copied to accelerate the creation of future projects. All enhancements should be done in the template project so there will be no confusion as to where the latest and greatest structures for new projects are located. Quality checklists are developed to direct a thorough assessment of the work being conducted by contractors and provide a complete list of items to be verified before the work unit can be signed off as complete. Considering all the disciplines within a construction project, you may have dozens of checklists prepared for your projects. If these checklists are maintained in electronic format, there are methods to convert the documents to a character separated variable (csv) file format for import into the BIM 360 platform. BIM 360 Field guides the inspector through checklist questions and can automatically generate issue cases based on the response to the question. Executing checklists on a tablet enables users to attach pictures of the completed work to support the details of issue to improve resolution. Once the issue is identified and synced to the database, the appropriate members of project team can get to work on resolving the issue and completing the work. Admittedly, we had a very quick win for our initial project because it only required getting team members enrolled on the platform and then showing them how to navigate to the Daily Update tools in the interface. Our starting point was to leverage Daily Activity Reports and the execution of Checklists within the application. This meant maintaining our existing File Transfer Protocol (FTP) solution before moving all project information to the BIM 360 library. The goal was to simplify the creation and logging of Daily Activity Reports to be easily leveraged for monthly reporting back to the owner. Features as simple as populating weather conditions for the location when the report was started alleviates this trivial data entry and improves the accuracy of data. In the labor component of the report, contractors onsite are selected from a dropdown selection, number of workers onsite and hours can be easily captured with a comment and uploaded to the database. We were directed to only concentrate on construction activities after the bidding phase of the project was completed for implementation. The important distinction regarding checklists in BIM 360 Field is the difference between creation of checklist templates for reuse and instances of a checklist to be executed. The creation of checklist templates mentioned in this step describes a transfer of existing checklist questions and procedures being converted into BIM 360 Field checklist templates. Instances of these checklist templates are created for each unit of work in the project to be executed when the unit of work is complete. For our project, we were able to convert questions from Microsoft Word documents to an Excel Spreadsheet, code the expected response field in a specific format, and upload to BIM 360 Field. If you do not have a library of documented checklists available, I recommend mapping out the review process of each work discipline on your projects outside of technology, like a whiteboard or piece of paper. Determine the critical inspection points to satisfy signoff on the work with a subject matter expert. 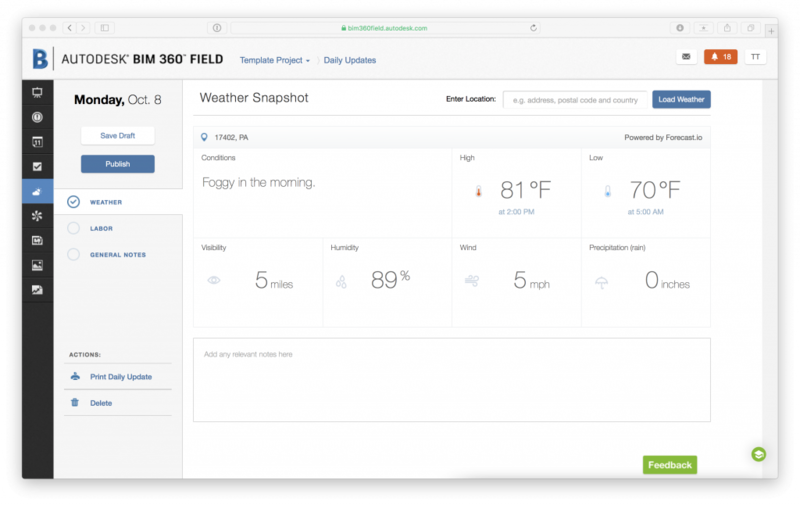 Do not try to create the checklist content in BIM 360 Field, as it will stifle your creativity. This was a successful implementation with some quick wins for the client but has quickly become the new norm. As contributors experience the efficiency of centralizing the construction project information and status, creativity abounds. This is just an initial implementation and continual advancement is needed to truly realize the complete value of the platform. I recommend a methodical approach to addressing your construction management challenges in priority order. Leadership must champion this implementation by mandating use by internal team members and compelling partners to participate in earnest. While this may be a “technology” project, two-thirds of every technology project is getting the people and the process right. When determining the scope of any technology project, it is always best to walk before you run, or you may end up in the wrong place!